Joey Pederson picked up his second consecutive NLRA feature victory of the season Thursday night at the Red River Co-Op Speedway near Winnipeg, MB. It's his third win of 2013, and his seventh career NLRA series triumph, tying him with Troy Olson, and Troy Schill for eighth on the NLRA's all-time wins list. Above is a picture of Joey at speed at the River Cities Speedway before the rains came on June 14th. Photo courtesy of Rick Rea. Zach Johnson, and Joey Pederson each kept their strong seasons going with NLRA series victories last week. 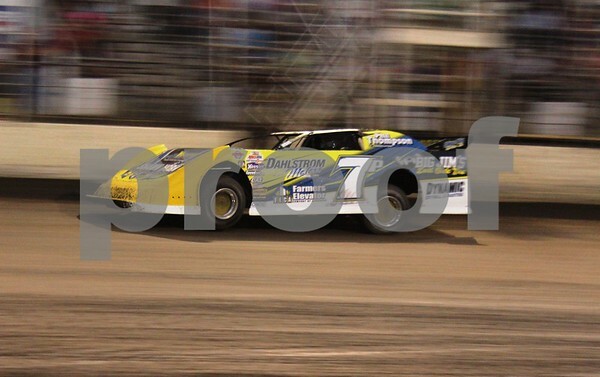 The action began on Wednesday Night at the Norman County Raceway in Ada, MN. Zach Johnson of Kensington, MN moved up from the fourth starting spot in his heat race to pick up the victory that would lead to him drawing the pole for the main event. He never let that draw go to waste as he dominated the 30 lap main event, especially in the early going, as he lapped half of the races' 28 starters, before a caution on lap 22 bunched the field back up for an eight lap shootout. The NLRA Late Models are set to invade the Norman County Raceway in Ada, MN on Wednesday Night June the 19th for the first of three visits to the speedway this season. This event marks the 9th time the NLRA has raced at 3/8 mile oval on the Norman County Fairgrounds. Donny Schatz has announced he will compete with the Northern Late Model Racing Association at two area tracks. Schatz, who is the five-time and defending World of Outlaws Sprint Car champion, will race Wednesday night June the 19th at the Norman County Raceway in Ada, MN. Then on Friday Night June the 21st, he will pull double duty and race with both the NLRA and the World of Outlaws Sprint Car series at the River Cities Speedway in Grand Forks, ND.